Isla de Pascua… A tiny spot in the immense Pacific Ocean. It is a triangular island that only measures 21 by 24 km, find this between all that water! Hanga Roa is the only city on this volcanic island, where there live around 3000 persons and the hordes of tourists that enter and exit there. There lands a daily LAN flight with a Boeing 747, dropping around 250 people there. The island is part of Micronesia, a group of islands formed by the triangle New Zealand – Hawaii – Rapa Nui. In the days of old the Polynesians discovered the spot and started a civilisation there, with the worldwide known Moai statues. 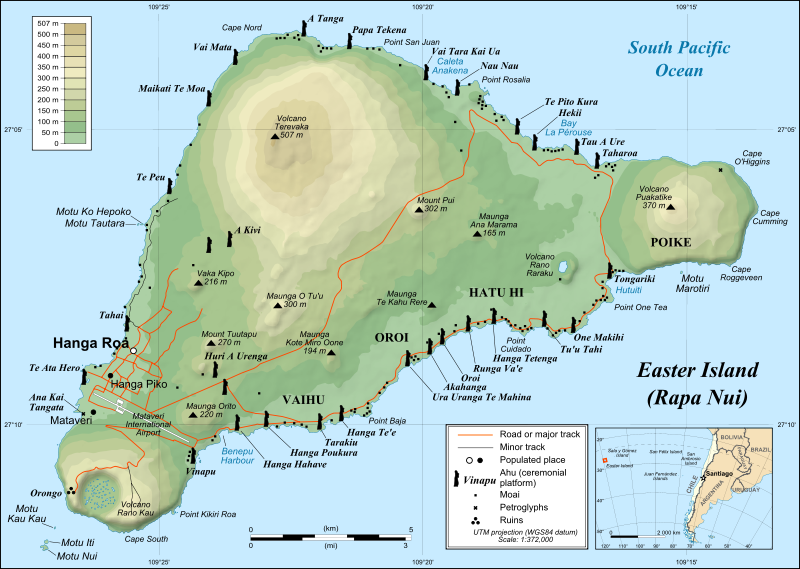 It is an island formed by three extinct volcanoes, one on each point of the triangle : Poike (the oldest) – Rano Kau – Maunga Terevaka (the highest and youngest). Now the wind and sea happily erode the island, so within a couple of hundred years it is doomed to disappear again under the sea. Rapa Nui is the local Polynesian name and Easter Island the name the Dutch sailer Jacob Roggeveen gave the island by its discovery on Easter Sunday 1722. Before the colonisation the biggest part of the island were forests, but to make it economic attractive the colonists put farms or sheep on it. So nowadays huge green pastures are a common sight. Between 1722 and 1888 the islanders had to endure hard times, when whalers, planters and slavers visited (or better raped) the island. In 1888 it was annexed by Chile, but that gave it to a wool company who exploited the island further. The few inhabitants that were left after the disastrous 18th century were put somewhere on the island where they couldn’t harm the sheep or they were transported to Tahiti… It took till 1967 with the installation of a permanent air link that the Rapa Nui people received some more benefits, most of them after a bloody revolt. Since 2008 it became a spot with some more privileges than the rest of Chile, but independence still has a long way to go. The Rapa Nui clearly remember all the hard repressions and the restriction to leave the island. It is only very recently they received more rights! However tiny, it has a lot to offer. The island roams with the famous Moai statues placed on ahu’s (a kind of man-made platforms) along its shores… The best way to discover these statues is by hiring a bike, car or motorbike and explore the perimeter of the island. We rented a bike and crossed the entire coastline during our first two days. A lot of nice archeological locations greeted us. The best ones were ahu Akahanga, with a beautiful collection of fallen statues; ahu Tongariki, with his 15 Moai looking to the centre of the island and ahu Anakena, the only beach with an archeological value. It stays special that all the Moai statues are different. After that we also explored Rano Raraku, an old volcanic crater where the statues were carved. This site has the highest concentration of statues on the island, since most statues were never transported to an ahu. Until now there are some 900 statues discovered and archived, while only some 200 a 300 are placed on an ahu. In Puna Pau we discovered that here the topknots of the statues were carved here in the red rocks, before they were placed upon the Moai. What these knots actually symbolise, stays even now a mystery. During our walk to the ceremonial city of Orongo, on the top of Rano Kau, we learned about the cult of the bird-man. He had to obtain the first egg of the sooty tern, who nests every year on the small nearby Moto Nui. It was always a hard clash between the different clans to become – or stay – leader for another year. Along the coast we discovered a couple of caves, which housed the first Rapa Nui and who were important hiding places during war. We needed our full five days and our bike to visit all these spots… Some 3 days extra wouldn’t have been to much. This incredibly tiny island asks a long time to discover. The waters around the island contain few phytoplankton, what makes them one of the clearest ocean waters on earth. The visibility can easily peak to 70-80m. The coastline has a couple of very attractive surfing beaches also… We checked this amazing visibility during a couple of dives. For the fishes you don’t need to go in the waters, since there are only a few species that live there. The over fishing causes now that the sea urchins roam. The Moai on the bottom of the sea is a cemented one and thus very recent. But the clearness of the water stays amazing! Only for that it is worth to do a couple of dives. For the rest we enjoyed the local ice cream in the harbour… Undoubtedly one who can compete with the one on mainland Chile. The local vegetables have an intense taste in the fertile volcanic soil, while guava’s grew everywhere. Just stop by to pick a handful of these delicious fruits. And our last day we got a great overview over the island from the top of Maunga Terevaka, the islands highest point. From the top we had a great view over the entire island. After a magical week on this subtropical island it is time to fly back… With pain in our hearts we leave this amazing and inviting island behind. Nonetheless we’re very happy that we visited that unique place.